Being a marketer, you always search for some or the other data depending upon the type of industry you are into. Because without data the marketing will not take up any shape. Customers are searching with different terms for various products and services. So the marketer needs to know the exact psyche of the customers. And Google Google is always there to the rescue. Google has many numbers of platforms like Google Trends, Google AdWords, Google Keyword Tool Planner to name a few. 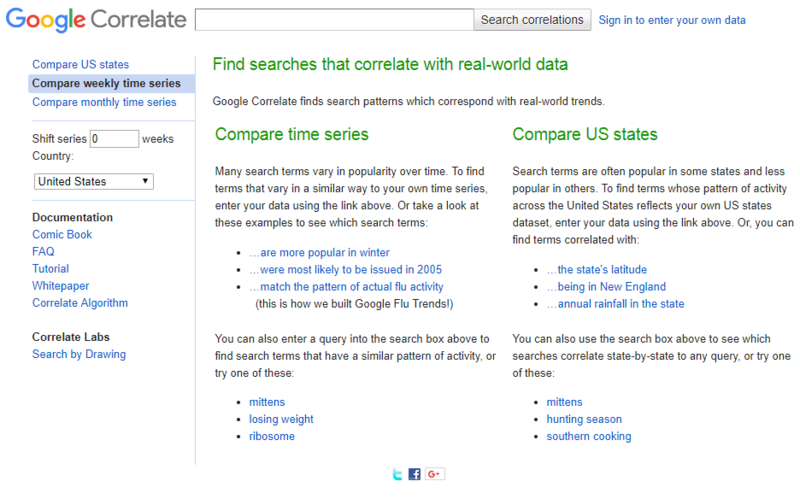 Also, there is another platform named Google Correlate. You can say that it is a secret keyword planner. Google has surely done some cool things and we all are thankful for that. On a serious note, Google makes our lives so easy that we do not even realize it. With Google Correlate, you can exactly know what people are searching for a particular product or a service all around the world or in a specific country. You can even upload your data and Google will match the patterns and search volumes. It uses the web search activity of the users in order to find out the similar pattern put up by the marketer on Google Correlate. The results of the queries are displayed on Google Correlate website and a CSV file can also be downloaded. So basically, many people are saying that Google Correlate is like Google Trends in reverse. When you are using Google Trends, you type in a term and it gives you the data related to it. But when it comes to Correlate, you enter a target word or data and it gives you the list of queries. How does Google Correlation work? So it is very simple to use. First, you log in to the website www.google.com/trends/correlate. Then you get a window in front of you like you are seeing in the below screenshot. So once you open the website, you can just type a work to which you need to find what and how people are searching about it. For example, if you are into the gaming industry in Australia, so you can simply type “games” in the search area and you get the results. You will see what keywords people are using currently. Also, you can use the shift series to see what keywords they were using one week back or 2 weeks back or month back. And based on this, you can plan your keyword strategy. Now you are seeing in the above screenshot that what people are searching in the genre of games currently. Now I will be changing the shift to 20 weeks, and then you can see the change in the below screenshot. You can clearly see from the above screenshot that in just 20 weeks how the preferences of the users change with everything. Shooting games are the highest priority right now, and 20 weeks before it was carpoint games. When it comes to a business, keywords are the foundation for that when it comes to the search engine optimization. But it is a real task to get the exact keywords. With the evolution of different keyword tools like Google Keyword Tool Planner, Keyword Planner etc, the job has become easy. But again, these tools give you a huge list of keywords which becomes difficult to deal with. Google Correlate generates lists that correlate with your target keyword by default. It won’t generate hundreds and hundreds that you can simply copy and paste. What Google Correlate generates are the search trends and if you are incorporating those search trends in your strategy, then you will surely rank higher in the Google search rankings. Even if you want to enter into a different industry, you can take help of Google Correlate to spot the trends and then go further. You will definitely find a lot of noise in there, but then you will also find some hidden gems that can change the complete scenario. You have got a good tool at your disposal. Basically, you can plan not just SEO strategy and keywords from this, but also you can use it for the content generation. Spot the trend and you can write on it with the incorporation of the keywords. It is nothing but a secret weapon to dig out the keywords related to your domain. The tool is indeed a powerful one! And you will be able to understand it properly when you go and play with it. If you have any other interesting use of this tool, you can share it in the comment box below.